Baked beans on toast FTW! One of the things the nurse said at the workplace health check a couple of weeks ago was about including a variety of fruit and vegetable in my diet. You beauty! That there is an official recommendation to cook one of the laziest, least effort meals known to man. I had it tonight. Heinz’s finest on wholemeal bread. The can notes that it is the equivalent of four serves of vegies, though it also says in very small writing that eating a variety is important. And of course there’s a fair bit of salt in one can, so you wouldn’t want to eat them morning noon and night. But those reservations aside, what’s not to like? Gee……. even as a kid I found baked beans repulsive. I remember being fed them by someone I was baby sitting for as a teenager and just thinking ‘the texture is revolting’. They are one of the few foods where texture is a concern for me…. @Andrew V, heheh. Funny. Mind you, while I know in popular culture beans are linked to farting, it’s not something I’ve really noticed in real life. Perhaps it affects people who don’t otherwise have a lot of fibre in their diet. The nurse should have said that they are even healthier with a serving of chips! They are pretty low-fat, too. I seem to remember them being on the recommended foods list when I did Weight Watchers about 8 years ago. We have it at least once a week. Yummy, quick, and healthy. 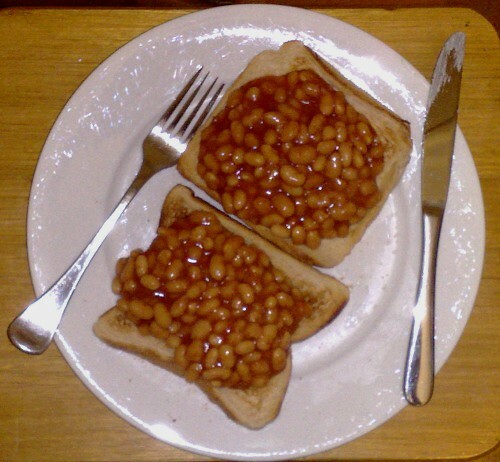 Though try watching Masterchef whilst eating baked beans, it does make you feel a tad lazy. To me, baked beans of toast is one of the ultimate ‘comfort food meals.’ To sprice things up, I recommend some black pepper, and glass of red to accompany the meal. But BBs are damned hard to find AND expensive here in Japan, so a rare treat for me. I tried making my own with less sugar and salt, and then Woolies and Coles stopped selling the beans. er…that was meant to be ‘baked beans ON toast.’ ‘Baked beans of Toast’ sounds like a very odd, British, upper-class-twit title. I’ve never been much of a fan of baked beans, although it’s the texture I find off-putting (as @shell said) rather than the taste. I like spagetti on toast but my friend loves backed beans on toast. He had it today at school. I like to mix it up a little though, rather than just plain beans. By preference: all of the above. I’ve also on occasion added tinned/drained sweet corn (little juicy pops of sweetness). Daniel. I forgot to tell you something in the Cinderella and the ghost station. Caroline Springs station should be built in the Melton Electrification and the line should only be electrified to Caroline Springs via Deer Park. Ah, baked beans. Is there anything they *can’t* do? I know it’s healthier having wholemeal or even better a dense heavy bread but fresh white bread is the nicest with beans & spaghetti too.